Hello, how can I get reading material not expensive or free please. Let me know - prek to 4 grade. I have two kids and the boy does not read very good. He needs all the help. Also I send books to schools in Lima Peru for kids in that country to read in English, and get to like the language. Thank you very much. V.
It's not easy to find really good free reading material online. That's understandable when writing, illustrating and publishing are professions and like all professions, they expect to be paid for their time and their tremendous talent. My personal belief is that publishers and authors who offer some work to the public via a website will be rewarded with a loyal fanbase and new readers. I am judging this solely on my own online behaviour, and also commonsense. I LOVE publisher sites that offer me value in the form of learning activities to support books, or writer sites where I can get a taste of a book, or at least of the writer's style. If I'm buying online, I would much rather spend money on a book when I have an idea of what the book is like, and that there is extra support for that book via a website. So, generally, google your favourite book publisher and writer sites to see what they offer. There are several websites that offer free online books. Unfortunately, just because a book is free doesn't mean you will find great writing within its cyber covers. I have found some gems though. Storyline Online is a huge free site. You can click on your book of choice and listen to it being read aloud by an actor, while you follow the words in a text box on the screen. It also weaves illustrations from the book into the video. Some of my favourites like Wilfred Gordon McDonald Partridge and Stellaluna are here. I love it because the books are ones I would recommend on my blog. Beautiful! Mrs P.com has some online stories, read aloud by Mrs P herself, after an entertaining introduction. Kids are listening to these stories rather than following with their eyes. There is also an intriguing-looking Magic Library but I couldn't get it to play nicely with my browser. The PBS Between the Lions website is excellent. If you don't know it, take some time to explore it with your kids. I like the fact the little videos are engaging AND help with reading by highlighting words as they are read aloud. Use the left side menu to scroll through all the choices, both fiction and nonfiction. Starfall has lots to read online. There are plays, myths, folktales, fables, fiction and nonfiction. Clicking on the ear icon will allow kids to listen while they read the pages. It really helps a young reader to hear the words spoken at the same time as he is looking at the words. That's one reason read-alouds are so important. Don't forget the poetry section at Starfall with poems like Who Has Seen the Wind by Christina Rosetti. Short texts like poems and songs can be very engaging for young readers. Let's not forget RIF's Reading Planet! Kids can watch and listen to stories there, and songs too. Do you know the author Mercer Mayer? He wrote the Little Critter books, fun for under 8s. His Little Critter site is generous, with several stories you can hear online in the form of Mercer Mayer reading aloud, and also pages to view and read online. 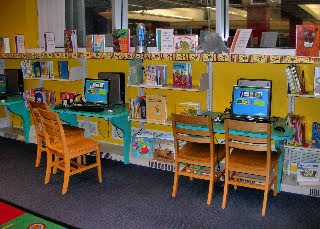 The International Children's Digital Library has hundreds of books from all over the world and in different languages. They are organized very well, and basically the site brings you a page at a time that you read with your eyes, then click the arrow to read the next. Not as high tech as some of the others, but special as an online library for the world's children. It's really worth a browse to see some wonderful illustrations. This also looks to be a useful way for self-published writers to promote their books. One book I enjoyed was Insect Soup, a book of poems about bugs. Not free, but One More Story also has some lovely books. In stories like Pete's Pizza, kids can listen and read along, with words highlighted as they are said. The story's illustrations are above, with the text below, just like a real book with kids either clicking to turn the page at their own speed, or opting for automatic. Unfortunately, a subscription costs. For homes, $44/year. Only you can decide if that is inexpensive for what your kids would get out of it. Personally, I would prefer a bricks and mortar library for free. At Robert Munsch's website, you can download the writer reading his own books aloud as mp3s. Though not for commercial use, you could certainy load them onto a player and your kids can listen while they read along on their own Munsch books or library books. Speakaboos has some great free stories like Arthur and Aladdin for kids to listen to and read along with. Boowa and Kwala have stories to read which chronicle the adventures of the two characters, interspersed with minimal animation and sound. This site is gorgeous. I have a separate post coming up about it soon. The library of Charlotte and Mecklenburg County has an online feature called Storyplace, which has a preschool and elementary section. Read some Beatrix Potter stories online. Read some classic fairytales online. At the BBC Cbeebies website, kids can read stories online, and listen to some at the same time. This might give your son an idea of a book he would like to search out at the library or at school. I love the voices in Charlie and Lola! Read Grimms FairyTales online. Kids can choose the text only version, or the flash version where they can listen and read along. If your kids are into jokes, they can read jokes online at Chickadee. We Make Stories is also a subscription site BUT one of its activities is free. At ReMix-it, kids can change the words of such classics as Black Beauty, from the options provided. Lil' Fingers has a storybooks section where kids can read (but not listen). Professor Garfield has toon books where you can read and listen at the same time. Cute illustrations. The Toronto Public Library has links to other sites for you to explore, and many great online stories of its own, like Owl Babies, a Book Chook favourite. We're not talking great literature with some of the sites above, but it might while away some time for your youngsters, as an alternative to print reading. I have to admit, I love "real" books best though. If you want actual print books that are not too expensive, the best place is your local library. Most libraries nowadays encourage borrowers to take several books for weeks at a time. They also offer audio books, videos, and even an online catalogue where you can search for and request the exact books you want. Children's librarians are some of the loveliest people I know, so make sure your kids get to know them, because they will have excellent suggestions to make. And don't forget your school library! Sometimes borrowing library books doesn't satisfy a child's urge to own a book. Do you have garage sales or markets near where you live? Regular trips to these will build your kids a fabulous home library in no time. And while you're at the local library, check to see if they have a "3 books for $2.00" trolley like mine does. Secondhand stores or Op shops seem to be a growth industry where I live, and these are also worth checking when you want to buy inexpensive books. I think it's wonderful that you are sending books to Peru for kids there. It makes good sense to recycle books that we no longer need, by sending them to kids who do. V, whatever reading material you help your kids to find, make sure you share it with them. Kids are never too young or old to be read aloud to, and we know for sure that a parent's reading aloud every day makes a difference to a child's reading attitude and ability. Nothing will ever replace a parent's role in encouraging and helping kids to read. Thanks for your letter to the Book Chook. Your kids are so lucky to have a mother who wants to be involved in her children's reading! Photo credit: Morguefile - Columbus (Ohio) Metropolitan Library, Kid's Section. http://bit.ly/aTV1Xf Latest Letter to the Book Chook - Free Reading Material. Places to find free reading material online and in reality. Thanks for mentioning it Jeanne! It's a new resource to me. I see they have some classics like Dickens retold to make them more accessible to kids. Yeah! RT @BookChook<wbr></wbr>: http://bit.ly/aTV1Xf Free Reading Material. Places to find free reading material online and in reality. NICE!!! RT @BookChook http://bit.ly/aTV1Xf Places to find free reading material online and in reality. RT @TWRCtankc<wbr></wbr>om: NICE!!! RT @BookChook http://bit.ly/aTV1Xf Places to find free reading material online and in reality. Great sites for online reading! Thanks Lori, Melissa, Mommy Bags and Julie! I was so glad to find you had a link here to one of our favourites - Pete's Pizza - we act this out lots of times with Rebecca as the pizza! A great online retelling! Thank you. Hi Carly! A starring role as a pizza sounds good to me too! Also, some of our books are under Creative Commons licenses and can be remixed/reused by parents/teachers. The images from these books have also been uploaded onto our Flickr account and can be a useful resource (http://www.flickr.com/photos/prathambooks/collections/72157619814442224/). Maya, thank you so much for sharing your resource, and especially for making material available under CC!